"I must inform you that, in my opinion, your service is not 5 star but 10 star. Always a pleasure doing business with you." "My order was handled very well. Your deliveries are always accurate and prompt. I love the shipping choice of FedEx that you offer. And if I may add, you offer an excellent selection of ammo at a fair price. Thank you for what you do and how well you do it." "Hello! I'm responding to this e-mail with glowing positive feedback because every time I order from you, I receive it in an extremely timely manner. Thank you for the fair pricing and great deals and professional service." "I just want to let you know I never miss reading your e-mails. I love your ammo deals and I find your "guides" and links well done and very helpful. Keep up the great work and keep the good deals coming." "All went extremely well. easy order, great fast delivery!..." "As per usual---your service was fast and excellent. Thanks"
"Always happy with my order. I teach gun classes and Active Shooter Response Training and boost Ammo.com every chance I get." "You guys have the best prices. I love the fact that you donate to the freedom group of my choice. On top of all that, the shipping is crazy fast!!! I could not have had a better experience anywhere else on earth!!! 5 star + service!!!" "I don't often find cause to communicate with sellers, but you folks are an exception. I want to commend you on the service that you gave me on this order. It was fast and accurate and CORRECT. The product is of good quality, the price was right and the shipping cost saved me money in that it kept me from driving all over two counties searching for what I was looking for. Most people don't count the cost of gasoline and time wasted. Consider me a regular customer. Many thanks." "Great customer service and timely delivery. I will definitely be using your site again for future purchases." "It was a five star experience and I will be back!" "Order came last Weds. and everything was fine. Thank you for asking and I no doubt will do business with you again in the future." "Order was great and ahead of delivery schedule. I've already recommended you folks to at least 6 of my friends. 5+ stars"
"My order was perfect and came in a timely manner. I look forward to doing more business with ammo.com"
"Both orders i have made with ammo.com have been with prompt shipments and competitive prices keep up the good work"
"I've come to expect only nice service from you guys----this order was no surprise or exception to what you always do, and that is deliver the goods quickly." "All ammo came undamaged and very fast in delivery. I really like doing business with your company and will continue to use your website as long as your prices, quality, and services stay like they are." "Everything was 5 star and delivered very promptly. Thanks a million." "Fast and friendly service and Thank you." "Great job!! Got it fast with no issues." "Everything was 5 star, thank you. First, your salesman was so helpful with information that I had no idea about. He treated me with respect, even though I did not know about ammo and its effects on pistols. The order came quickly, complete and undamaged. Thank you for inquiring, please thank the salesman for me." "You guys are top notch. My order was handled perfectly and received the order in just a few days. Everything was great!! I’ll be ordering from you guys again. FIVE STAR!!!!" "As a first time customer, I was very pleased from start to finish with my order. I give you guys a five star rating! Ammo.com is now my first choice to purchase ammo." "Everything about my ammo order from your company was A-OK. I give you guys an A+." "Everything came in a timely manner and was correct. You guys are doing great. No complaints." "This was my second order with you guys and everything went like clockwork! My product was exactly what I ordered and it arrived very fast just like the first order I placed. I’m getting spoiled by you guys. LOL." "I have absolutely no complaints. My order arrived within two days, and was correct. I was unaware that you donated a portion of your profits to charity; but now that I know that, I have even more reason to make my future ammo purchases thru you. In a world that is rife with incompetence, it truly means a great deal to me that you go above and beyond. I have, and will continue to, send business your way." "Everything was great. The ordering, delivery and condition of the product on arrival was what I expected. The pricing was also reasonable. Thank you for the wonderful service." "Received my order correct and in a timely manner. No complaints. Keep up the good work!" "Nice job with my order. Everything arrived as scheduled. A pleasure doing business with you guys! You are my go to." "The order worked out just fine. Many thanks, I will be ordering again soon." "I haven’t had a chance to use the latest S&B ammo, but the quickness of the order is amazing. Both orders I have made were on a Friday just after Noon, and the packages arrived at my home the next day around 2 PM. I don’t think any other deliveries from anyone have been done with such speed, and the orders both arrived in fine shape. Thank you." "Got what I needed fast, thank u"
"You guys did a great job...super fast service...what more could one ask for. I will definitely use your service again!" "Great. I'll be shopping with you again. Thanks!" "I could not be more thankful and satisfied with my orders and service from you!!! I own 4 pistols in 9mm and 45 ACP and plan to continue to use your service to my advantage. You have allowed me to continue with a sport and pastime I love that helps protect myself and family. 5 Stars all around!!" "Great service! Awesome support and on time with the order and delivery! 5-star all the way! Thanks and talk to you soon for another order." "The ammo is great. Shoots clean. No excess smoke or misfired. Thank you so much." "I will say this – I am not ordering my ammo anywhere else ever again. Order got here fast and was 100% accurate." "Very happy. All went smoothly. Much appreciated." 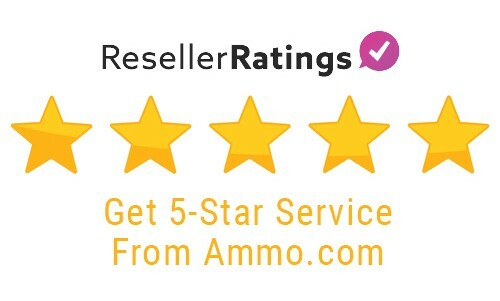 "I did indeed have a 5 star experience at Ammo.com!! Your website is very easy to navigate and the option to sort the offerings by cost per round is greatly appreciated, it makes the selection process very easy. I look forward to our doing business again." "Service was excellent, received my order quickly, 5-star service! I will be ordering from you again." "Fast shipping – I will deal with you again!" "More than happy with my order, came in only 2-3 days. I was shocked on how fast it got here. A+ I will buy from you guys again." "This was my first order from Ammo.com, but it won’t be my last. The ammo shipped at lightning speed and is the quality I expected. I have recommended Ammo.com to all of my shooting friends which are many. Thank you again for the quick shipping and low price. You have earned a new customer for life. 5 stars and 2 thumbs up!" "My order was shipped quickly and safely. The price was more than fair – 5 stars!" "I’m happy and your prices are great." "Thank you all for what you do for America!!!" "Spot on, thanks for setting up my favorite FFL. We will do business again." "Very happy. Great prices and delivery was prompt. Thank you for your service." "Arrived quickly and before Christmas! 5 stars. Will order again." "I was more than happy with your service. It's the first time I've ever ordered ammo and I will be more than happy to recommend your service to anyone. I've already told some people about you having the 7.5x55mm ammo I needed." "5-Star! Very happy with your prompt service and price." "Was very pleased with how fast my order came, thank you!" "I am impressed by the speed and condition my purchased items arrived!! Thank you very much and I am looking forward to doing business with you in the future." "Yes! I was and am TOTALLY satisfied with my purchase and plan to continue placing orders with you in the future." "Absolutely top notch personalized service. We have certainly established a great business relationship with ammo.com even as of our first order. Thanks ammo.com!" "Shipping was fast. Packaging held up well. Everything was there. I couldn't be more satisfied." "I am now a huge fan of Ammo.com. Pricing was very competitive, website was very user friendly and descriptive. Shipping was extremely fast and items were exactly as ordered. You have a customer for life!" "Your company did a great job! All my orders have been at a great price but also shipped quickly!!! Thank you and keep up the fantastic work." "Mission accomplished, extremely happy with deciding to order from your company. I've been looking for 7.62 x54 in the sealed spam can for a while now because no one else had it, so I’m happy with my order. Thank you"
"Everything as ordered, showed up as promised – I will use ammo.com again, thank you!" "I'm very happy with my dealings with your company! Thanks so much."